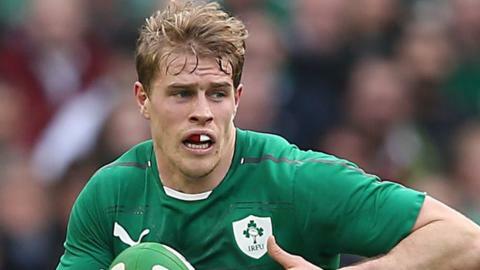 Ulster and Ireland winger Andrew Trimble has been named 2014 player of the year at the Rugby Writers of Ireland's awards ceremony in Dublin. Trimble, 30, scored two tries in Ireland's triumphant Six Nations campaign and also got six touchdowns for Ulster during the year. Niamh Briggs picked up the women's award for a second successive season. She was recognised for her performances at full-back during the World Cup in France. The Dungarvan native helped Ireland claim a famous victory over New Zealand. Trimble, currently injured with a toe injury, said it was nice to pick up an individual award but stressed it was down to being part of a successful Ireland side. "It is unfortunate to be injured at the moment, but watching the team play as well as they did against South Africa at the weekend makes me even more determined to get back on the pitch as soon as I can," he said.